On Saturday I was the first blog to report that the Nook HD had an unmentioned text-to-speech ability which enabled this ereader to read the text of ebooks to you. As cool as that feature was, it used an annoying voice and didn't do anything more than read the text. Today I learned that I should have looked a little further. 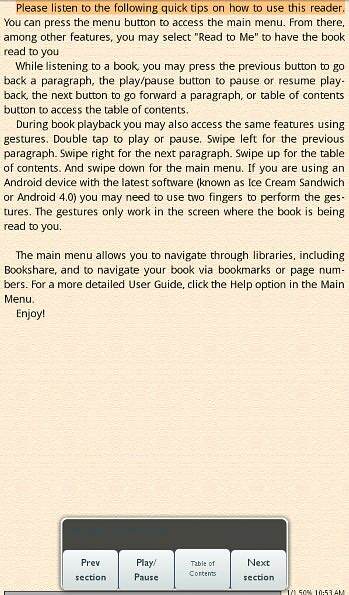 Apparently there's a hidden settings menu which will let you enable true accessibility features, including having the Nook HD speak the screen contents - including menu items - to you as your finger slides around the screen. The NFB blog tipped me to this story. B&N hasn't talked up any of this yet, but one of the apps in the Nook App Store was developed by Benetech, the nonprofit which maintains Bookshare (the world's largest online library or people with print disabilities). 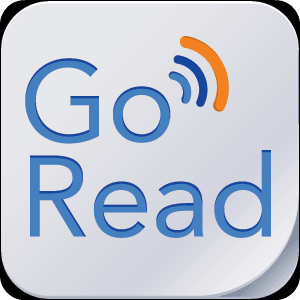 The app is called Go Read, and besides being able to read Daisy format digital talking books, this app will also allow you to access a hidden settings menu. I'm pretty sure this menu is a holdover from the underlying Android, not one which was developed by B&N, because it does not have a label nor have I found another way to get to it other than through this app. Once in the menu, I can see options for "Talk Back", "Explore by Touch", and more. I've been playing with it for about half an hour now, and while I wouldn't want to to be stuck with that voice it is not as annoying as I expected. There are also a couple quirks. For example, the unlock screen sometimes requires a 2-finger swipe while other times only a single fingered swipe. And the accessibility features have to be enabled by someone who can see the screen. But even with the shortcomings, Barnes & Noble has still managed to surprise me. Update: A reader has told me that the 8.9" Kindle Fire HD has similar accessibility settings. Curiously enough, I cannot find those features on my 7" KFHD. My Kindle Fire HD 8.9″ has an Accessibility option with Voice Guide and Explore by Touch as options. (Orientation Lock is also in that section.) Is this not present on 7″ Fire HDs? I tried it out and the voice is terrible. When it reads it’s own menu selection it plainly says, “Explore by Dutch,” not “Touch” for example. I’ve double checked my 7″ KFHD and it does not have those options. Interesting. How about the camera? I’ve read several people talking about there being no direct access to the camera on the new Fires and recommending apps that give such access***. But on my 8.9″ under Photos/Device there is a little camera icon that lets me take pictures. Did they change that from the 7″ models? I had to install an app to get access to the camera. There are alternate TTS voices you can install on android devices. I’ve heard very good things about the IVONA voices. It’ll be interesting to see if they work with either the FireHD9 or NookHD+.